If you need a 1920s-style party frock for a teen girl, this tip from Ruth Wyeth Spears describes how to whip up a lovely petal-skirted dress. Just get a few yards of crepe de chine in a lovely color and in no time you can have your girl looking chic for a summer party! The simplicity of the design amazes me - Ruth's techniques require no pattern and allow you to fit the dress to wearer. 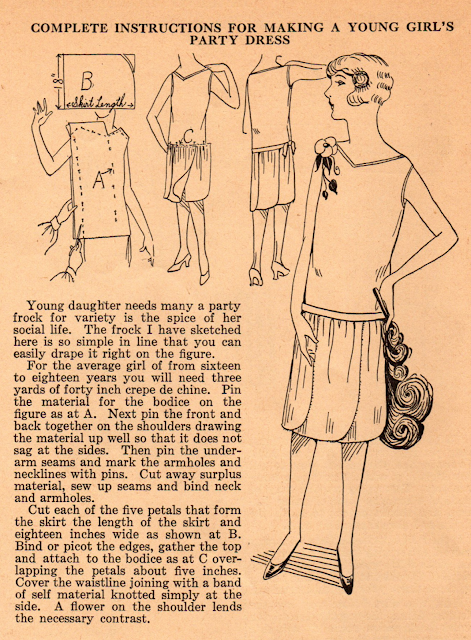 Don't be held back by the idea that this is a young girl's dress - I think it would work for any age! Kathleen, this is a wonderful post, love these patterns! I am delighted that you are delighted, Debora!